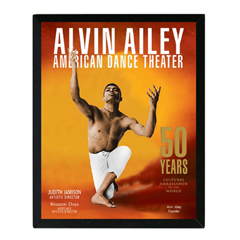 Alvin Ailey American Dance Theater turns 50 years old this year. The company makes a primetime special guest appearance on Tuesday April 1st Dancing With the Stars Results Show. AAADT will be featured as a part of “Macy’s Stars of Dance,” a weekly part of the “Dancing with the Stars Results Show” presenting some of the best choreographers and performers from different styles of dance. This performance will help kick-off Ailey’s 18-month 50th anniversary celebration and audiences will be delighted and inspired by their performance of an excerpt of Ailey’s signature masterpiece, Revelations accompanied by a Gospel choir. Over the next 18 months, as part of the 50th anniversary celebration, Ailey’s legacy will come to life through special events and commercial partnerships: the artist David Michalek has created video installation screens depicting slowed-down versions of larger-than-life Ailey dancers along the ground-floor windows of the Ailey studios on Ninth Avenue; Hallmark has produced a series of six Ailey greeting cards; the Library of Congress in Washington, D.C., opens an Ailey archive exhibit this May; Ailey will host a series of free performances and dance classes in all five boroughs of NYC in August; an Ailey Barbie doll is due out this fall, and in June, the Ailey company returns to the Brooklyn Academy of Music for the first time in 38 years.